One by one, every sphere where the company competed — from hardware to software to communications to content — was turned topsy-turvy by disruptive new technology and unforeseen rivals. And these changes only highlighted the conflicts and divisions within Sony. What’s more, The Times reported that as the company’s luster has tarnished, so too has its ability to charge a premium for its products. And these woes extend beyond Sony. According to The Times, Japanese companies seem to have run out of technology innovations. “But Sony couldn’t do better [than Apple]. It had pioneered portable music with the Walkman, it had a great record company, and it had a long history of making beautiful consumer devices. It had all of the assets to compete with Jobs’s strategy of integration of hardware, software, devices, and content sales. Why did it fail? Partly because it was a company like AOL Time Warner that was organized into divisions (that word itself was ominous) with their own bottom lines; the goal of achieving synergy in such companies by prodding the divisions to work together was usually elusive.” (pg 407-408). Sadly, Sony is not alone in the world. In many companies, hardware, software or content rule the day while other solution components get left behind. Sure, those divisional silos might generate short-term revenue and profits. But there’s a bigger, strategic problem here that’s critical to the long-term health of the company. 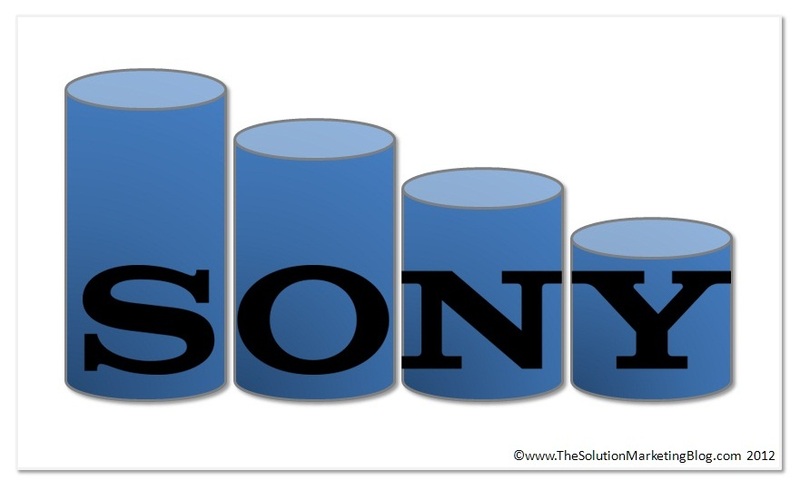 When a company lets its divisions grow into independent silos that fight each other for the same customer, thereby creating disjointed customer experiences, products and/or services, one thing is clear: the company as a whole has lost its focus on the customer – and that’s what’s happened at Sony. Consider a different scenario. When you start with the customer (and prospect/user/buyer) and understand their top challenges and their needs, interesting things start to happen. First you develop a deep appreciation for the customer. Who are they? What are their hopes and desires (yes, this applies as much to enterprise solutions as it does to consumer solutions)? What keeps them up at night? What problems remain unsolved? And then – and here’s where it really gets fun – you begin to consider how your company can use its particular expertise to solve those problems. How can you best combine your company’s and your partners’ existing and new assets and competencies to create compelling new solutions to customer problems. Putting the customer first does not magically unify silos or bring a company together. But it can give a company a common purpose. It’s a start because it shifts the focus to the folks who really matter and who really keep your lights on: your customers. And when you have a clear focus around them, your other strategies can fall into place. Bottom line: instead of focusing on divisional objectives alone, you need make sure that the company as a whole unifies around a common vision of who the key customer is, what they need and how you can help them.